For this week’s Hand Stamped Sentiments ribbon and lace challenge I created this corset template. The template is sized to fit into a SU medium envelope (5-3/4″ x 4-3/8″). I traced the corset on Very Vanilla CS then ran it through my Big Shot with the Vintage Wallpaper embossing folder and sponged it with Riding Hood Red ink. I used the 5/8″ Victoria crochet trim as lace. I put a strip of stick tape on the back of the crochet trim and pleated it as I adhered the trim. I used my Crop-a-dile Big Bite to set the 1/8″ eyelets and used grosgrain ribbon to lace the corset. The regular hand-held Crop-a-dile will not work because it doesn’t reach. You can also use a regular eyelet setter kit. It was a lot fun creating this card. The possibilities are endless in creating this card. You can use different embossing folders, different colored card stock, clear rhinestones and different ribbons. I create these as invitations for hens night, bachelorette or bridal showers. Got to my Etsy shop to order and request your custom color. This week at Hand Stamped Sentiments there’s a big announcement. We’ve added five more designers to our Design Team. We’re so excited! Please hop on over and welcome them by leaving a comment. Also we have a wonderful color challenge with the romantic colors of red, black and ivory or white. You can use any shade of red – Real Red, Cherry Cobbler, Riding Hood Red or any other shade of red you prefer combine it with Black Whisper White or Very Vanilla. I’ve been wanting to make different versions of corset cards and I CASED this corset shape card from Ink Stained Roni. Hop over to her blog to get the template and other ideas. The card base is Very Vanilla and I covered the front of the card with the music notes background from the Newsprint DSP and I sponged the edges with Riding Hood Red. I’m down to a couple of sheets and I must buy more Newsprint DSP. I’ve also been playing with the Red Glitter paper and I think it’s fabulous. It’s perfect for adding that touch of bling. I punched the hearts with the Small Heart punch and I also used my favorite embellishments – Victoria Crochet Trim and Vintage brads. The candle is stamped with the medallion and flourish from the Artistic Etching stamp set. I also added a red glitter heart and crochet trim. 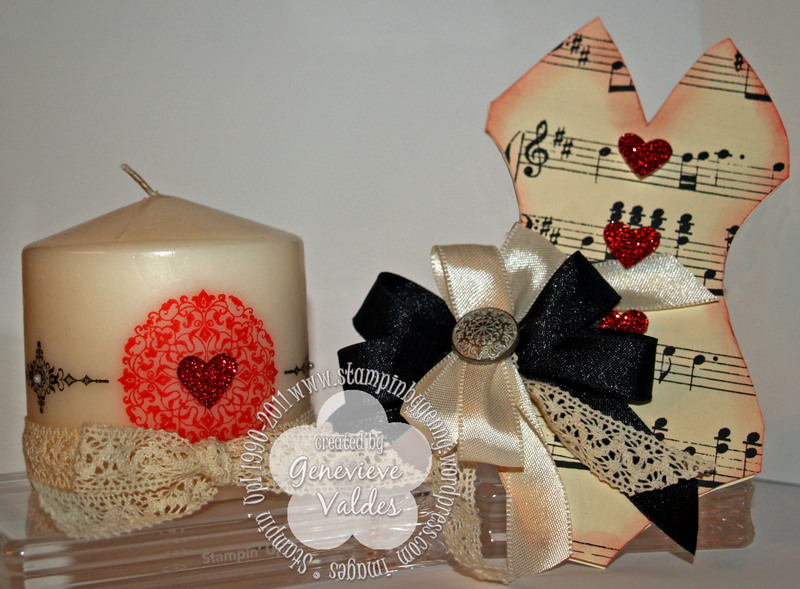 Stamping on candles is very easy and there is a step-by-step tutorial on SCS. I hope you’re inspired by this week’s color challenge and show us your romantic side on HSS. I also love the challenges over at PPA so I submitted my project. There are so many talented crafters that participate. Check them out.